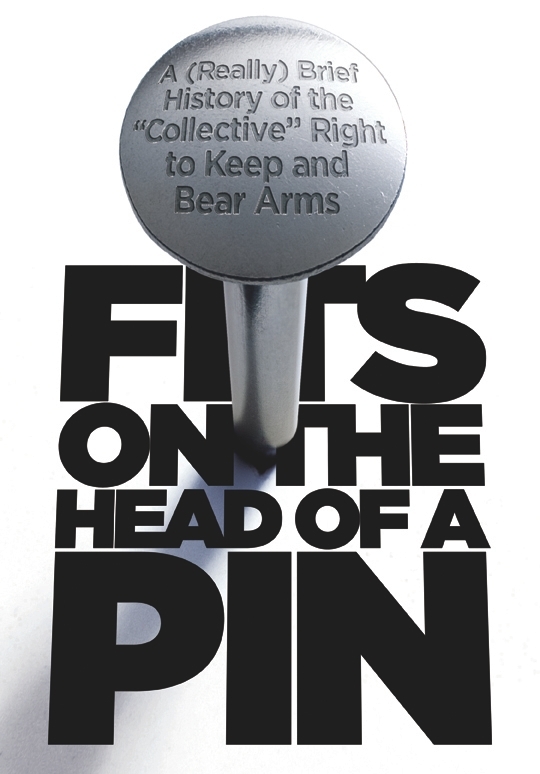 Brief enough to fit on the head of a pin because not a single one of these 19th-century Supreme Court cases supports a “collective” right. In spite of that fact, media and gun-ban groups continue to insist that the U.S. Supreme Court once found for a “collective” right--but, alas, history tells a very different story. As the Supreme Court prepares to hear the case of District of Columbia v. Heller, involving the District’s bans on handguns and on self-defense with any firearm, gun prohibition advocates claim that the Second Amendment has no modern relevance because it protects only the “collective right” of state governments to control their own militias, or that it protects only the “narrow individual right” of National Guardsmen who are actively engaged in Guard duty. In reality, however, the Supreme Court’s Second Amendment cases from the 19th century entirely refute the prohibitionists’ claims about legal history. Houston v. Moore The first case in which the Supreme Court mentioned the Second Amendment was Houston v. Moore, in 1821. During the War of 1812, Mr. Houston refused to appear for federal militia duty. He thereby violated a federal statute, as well as a Pennsylvania statute that was a direct copy of the federal statute. When Houston was prosecuted and convicted in a Pennsylvania court martial for violating the Pennsylvania statute, his attorney argued that only the federal government, not Pennsylvania, had the authority to bring a prosecution; the Pennsylvania statute was alleged to be a state infringement of the federal powers over the militia. When the case reached the Supreme Court, both sides offered extensive arguments over Article I, section 8, clauses 15 and 16 of the Constitution, which grant Congress extensive powers over the militia. Responding to Houston’s argument that congressional power over the national militia is absolute (and therefore Pennsylvania had no authority to punish someone for failing to perform federal militia service), the state’s lawyers retorted that congressional power over the militia was shared with the state power. They pointed to the Tenth Amendment, which reserves to the states all powers not granted to the federal government. If the purpose of the Second Amendment were to guard state government control over the militia, then the Second Amendment ought to have been the heart of Pennsylvania’s argument. Instead, Pennsylvania resorted to the Tenth Amendment to make the “state’s right” point. Quite plainly, the Pennsylvania government lawyers relied on the Tenth Amendment, rather than the Second, because the Tenth guarantees states’ rights, and the Second guarantees an individual right. Justice Bushrod Washington delivered the opinion of the court, holding that the Pennsylvania law was constitutional because Congress had not forbidden the states to enact such laws enforcing the federal militia statute. After acknowledging that the Second Amendment (mislabeled the “Fifth Amendment” in a typo) was probably irrelevant, Justice Story suggested that to the extent the Second Amendment did matter, it supported his position. Justice Story’s dissent is inconsistent with the collective rights theory that the Second Amendment reduces Congress’s militia powers. Immediately after the Second Amendment hypothetical, Justice Story stated that if Congress actually did use its Article I powers over the militia, then congressional power was exclusive. There could be no state control, “however small.” If federal militia powers, when exercised, are absolute, then the collective rights theory that the Second Amendment limits federal militia powers is incorrect.